Bryophyllum pinnatum (Air plant) is a succulent, perennial herb plant. It grows up to 1m- 2m in height. The leaves (5-25 cm long and 2-12.5 cm wide) are thick, green or yellowish-green in colour, hairless and are borne on stalks 2-10 cm long. The leaflets are oval or narrowly oval in shape with rounded tips, and when more than one leaflet is present the end leaflet is usually significantly bigger than the others. Plantlets grow from the notches of the leaf margins, and they can develop either while still attached to the mother plant, or when detached. It has drooping bell-shaped flowers are greenish-yellow to pinkish-red in colour (up to 3 inches long). The fruit is papery and membranous, with four slender compartments. They generally remain enclosed within the old flower parts and contain numerous minute, slender, brownish-coloured seeds. Common Name: Air plant, cathedral bells, life plant, miracle leaf, Goethe plant, Tamil: Malaikkalli, Runakkalli. It thrives best in full sun to partial shade. It requires a minimum of four hours of sun daily. It grows best in a sandy, well-drained soil such as a cactus potting mix or one part peat moss mixed with two parts loam and sand. Water your plant regularly during the growing season and always keep the soil evenly moist but not soggy. You can allow the top 2 inches of soil to become slightly dry between each watering. Reduce watering during the winter months. It prefers ideal temperatures that range between 50 and 70 degrees Fahrenheit / 25 to 30 degrees Celsius. Fertilize every three months between March and September using a balanced liquid fertilizer diluted by half. Re-pot your plant every spring, but only when the plant outgrows the pot. Pick the next pot slightly bigger than the first one. It can be easily propagated by seed, cutting, leaf, division or by means of the plantlets which at times growing up at the base of the petiole. Even a single leaf stuck into the soil or potting medium will take root. It grows easily roots at the end of a leaf stalk which has fallen onto the ground. New plants are ready within months. There is no serious pest or disease problems. The Air plant is subject to attacks of aphids and scale insects. 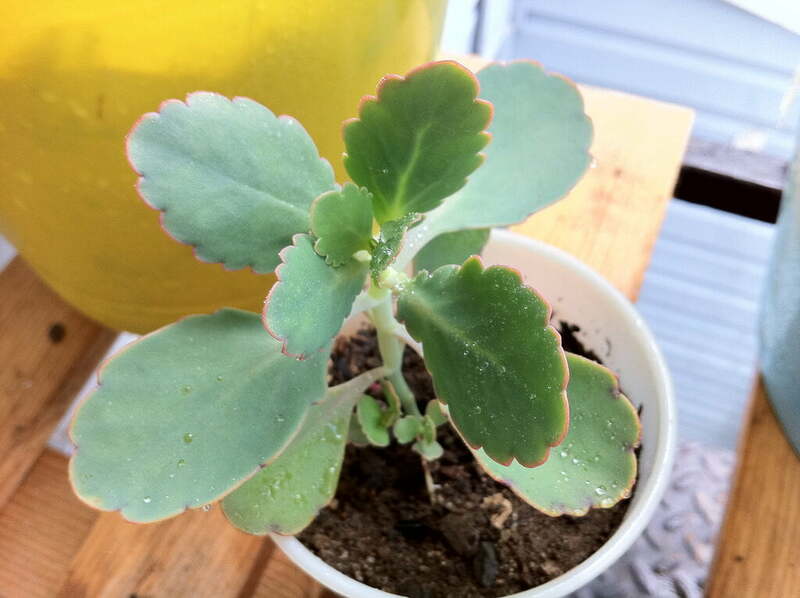 Bryophyllum pinnatum is valuable to treat conditions such as shortness of breath, kidney failure, menstrual problems, asthma, coughs, bronchitis, as well as the chest cold. The fresh leaves of air plant can also be eaten raw as a medicinal remedy for asthma, bronchitis and intestinal problems. The crushed medicinal leaves of this herb will bring relief from insect bites, bruises, boils, and also skin ulcers. The leaf juice is utilized for the treatment of stomach ache. Bryophyllum pinnatum has been found to contain bufadienolide cardiac glycosides. These can cause cardiac poisoning, particularly in grazing animals.